Hydromar proudly announce a new order for a Seascape Mini for a 23m new build project in The Netherlands. From the METSTRADE 2017 and Boat Dusseldorf 2018, Hydromar received many enquiries from yacht builders up to 30m for the smallest sized Seascape. Specific for this range of yachts (20-30m) we developed this Seascape. Due to the many enquiries of the last half year the development of the Seascape Mini came in a rapid. For this specific target group Hydromar decided to put the Mini Seascape in production as a semi-series product to create a production advantage and thus be able to offer a more competitive price level. The Seascape is a hydraulic moving bathing platform based on the core competence of Hydromar: tailor made equipment based on standard solutions. High quality, stability, aesthetics and functional design are keywords embraced in the Hydromar Seascape bathing platforms. The bathing platform is based on a Z-shaped movement and produced in three sizes in which variables are possible. The Seascape is always delivered with a complete working system including power pack with e-controls and an aluminium platform. The Seascape Mini is designed for yachts with smaller space reservations in the aft of the swim platform deck. The design is customizable within certain limits. Like the width of the platform and the number of steps. However the typical platform width is 2m wide where the length depends on the number of steps with a maximum of 5 steps. The safe working load depend on the number of steps as well. Yet we claim to say that 300kg at the end (un-supported) of the platform is standard. The steps between the stair boom are self-inclining with on fixed step between the drives. The Seascape Mini has a typical weight of approx. 500kg. 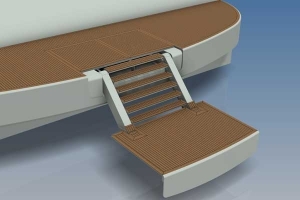 Based on the number of enquiries Hydromar has received over the past years and the interest in this product, Hydromar realized that many owners and shipyards desire a bathing platform system in their yacht. 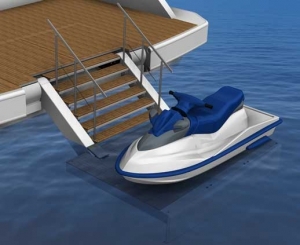 Therefore Hydromar developed a range of four bathing platforms to be able to provide yachts from 20 to 30m towards large projects from over 100m. The regular Seascape models come in three standardized sizes in which variables are possible. The fourth size is the Seascape XXL, developed as a special product with 100m+ vessels in mind. Need more information? Please contact Rob Montijn, Managing Director or Steven Hartgers, Sales Engineer.